I’ve been attending crime writing festivals for the past few years, initially as a fan and a reader, and later as a crime writer hoping to find her way onto the publishing ladder. 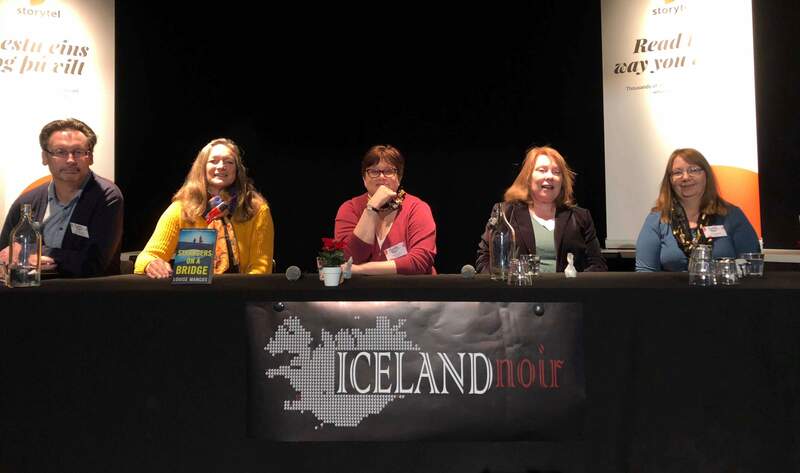 A couple of weeks ago I attended my second Iceland Noir in Reykjavik, and this time I was on the other side of the panel as an author. In case you haven’t heard me shouting on social media, my debut psychological thriller Strangers on a Bridge was published this past summer with HQDigital, an imprint of Harper Collins. As the hall began to fill at the event, my fellow panellists Sarah Ward, Sandra Ireland and Mary Torjussen set me at ease with reassurances that I would be fine, all of them having appeared previously on author panels at various festivals. The British Ambassador to Iceland, Michael Nevin, revealed he was also a debut moderator, but with his years of public speaking, I had no doubt he would direct proceedings with grace and eloquence. The panel was entitled Buried in the Turf House. This is a traditional Iceland dwelling, the perfect setting for a darker side of fiction, and as the premise of each of the authors’ novels range from domestic noir, to psychological thriller and dark family legends, the analogy was well-attributed. There was a moment of panic under the spotlights when I couldn’t remember anything about my novel. But once the discussion was underway I enjoyed talking about this piece of work that has taken up so much of my head space for the past few years. Novels are like authors’ children, and a parent should be allowed to extol the virtues of their creations. As I looked out to the crowd, it amazed me that there were people interested in learning not only about my novel, but also me as a writer, and the friendly welcome I received helped to alleviate the feeling of imposter syndrome as both a debut novelist and a debut panellist. I love attending these festivals. Writing is a solitary career. Authors spend more time with plots, settings and characters than we do with our own families. The opportunity to attend festivals with other authors, readers, reviewers and bloggers offers the chance to talk all things bookish that have been kept inside our heads for the months at the writing desk. I have never been made to feel anything other than welcome at all the festivals I have attended, and it was wonderful to catch up with old friends in Reykjavik, but also to show my new book baby to the world. I wrote a blog entry last year about the benefits unpublished crime writers reap by attending festivals such as CrimeFest in Bristol and Theakston’s Crime Festival in Harrogate (the two largest such festivals in the UK). But the smaller festivals offer an intimacy where fans can get closer to their literary idols (I put myself firmly in the ‘fan’ category here) and it was a thrill to meet writers such as Mari Hannah, Shari Lapena, Mark Billingham and Liz Nugent. Iceland also offers natural wonders not to be missed. Having flown from the Alps, I wasn’t going to pass on the opportunity of visiting Reykjavik and the surrounding countryside. This festival caters for those who want to stay on for an extra day or two to play tourist. I think next time I shall stay longer, as the stark beauty of the landscape is a catalyst for suspense writing. The next Iceland Noir will be in 2020 as it is a biennial event and the organisational committee takes the festival to Hull next year. I’ll be amongst the first to sign up in 2020 when tickets go on sale. In the meantime, I will be appearing on panels at Rotorua Noir in New Zealand in January, and CrimeFest in Bristol in May, and will be attending a handful of other festivals throughout the year. Maybe I’ll see you at one of them! Please come and say hello.